The pH of seawater has decreased by 0.1 since the beginning of the industrial era, corresponding to a 26% increase in hydrogen ion concentration. […] It is virtually certain that the increased storage of carbon by the ocean will increase acidification in the future, continuing the observed trends of the past decades. 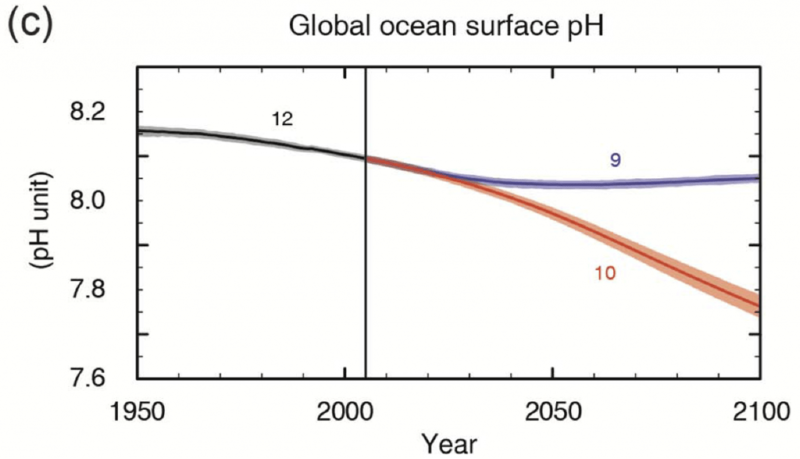 […] Estimates of future atmospheric and oceanic carbon dioxide concentrations indicate that, by the end of this century, the average surface ocean pH could be lower than it has been for more than 50 million years. Surface waters are projected to become seasonally corrosive to aragonite in parts of the Arctic and in some coastal upwelling systems within a decade, and in parts of the Southern Ocean within 1–3 decades in most scenarios. Aragonite, a less stable form of calcium carbonate, undersaturation becomes widespread in these regions at atmospheric CO2 levels of 500–600 ppm. This entry was posted on Monday, April 14th, 2014 at 7:56 am and is filed under climate, oceans. You can follow any responses to this entry through the RSS 2.0 feed. You can leave a response, or trackback from your own site. Are there any mitigation strategies for ocean CO2 (or some related chemical form it turns into or causes) as distinct from atmospheric CO2? For example, are there any proposed schemes for “direct removal of CO2 from the ocean”? I’ve heard someone argue that removing CO2 from water is much more efficient than removing it from the air. I’d be interested to know more about if this is true, and if so, why. Could it simply be because water in equilibrium with air holds much more CO2 per cubic centimeter than the air? Or is it also because lots of chemical reactions work better in water? • April Flowers, New CO2 removal technique produces green fuel, offsets ocean acidification, Redorbit, 29 May 2013. • Greg H. Raua, Susan A. Carroll, William L. Bourcier, Michael J. Singleton, Megan M. Smith, and Roger D. Aines, Direct electrolytic dissolution of silicate minerals for air CO2 mitigation and carbon-negative H2 production, Proc. Nat. Acad. Sci. 110 (2013), 10095–10100. Using nongrid or nonpeak renewable electricity, optimized systems at large scale might allow relatively high-capacity, energy-efficient (<300 kJ/mol of CO2 captured), and inexpensive (<$100 per tonne of CO2 mitigated) removal of excess air CO2 with production of carbon-negative H2. yes looks like a interesting method. On a first glance it looks indeed considerable “efficient” like when compared to the removal of CO2 from air. It would be interesting to know in that context how much usuable energy per Mol is on average produced per CO2 production, here are some first calculations. Don’t know how reliable they are. Very interesting. Are proper incentives in place to encourage investment in such things if they would be good? For example, uniformly applied appropriate taxes on emissions (and negative taxes on mitigations) would be ideal, but don’t exist; but maybe some less ideal approximation (like some form of “carbon pollution credits” for mitigations, broadly defined) could realistically exist soon? This is potentially tragic; a better compromise would be to risk some small mistakes, but not allow them to grow into huge businesses until there’s more certainty. The problem is that there’s been some gaming of the trading scheme and regulators are struggling to avoid more. The wollastonite experiments seem though to bind Calcium to CaSO4, which may have (?) an impact on the formation of CaCO3 and thus on corals and shellfish. Given that geologic sequestration of carbon dioxide at long scales is, I believe, principally mediated by it being bound up in carbonates and then subducted at trenches, could Steve or someone would be able to comment on how decreasing oceanic pH might impair this process? A related question — whether or not the oceans will “defizz” as temperature increases — was answered in Harte’s CONSIDER A SPHERICAL COW/CONSIDER A CYLINDRICAL COW pair of books (I forget which) — and the answer is not for a long time, and not until the oceans get really warm. Still another question is how much oceanic uptake of carbon dioxide from atmosphere is impaired by its increasing mean temperature. The chemistry for calculating that is also probably in Harte, but I don’t think he does it. 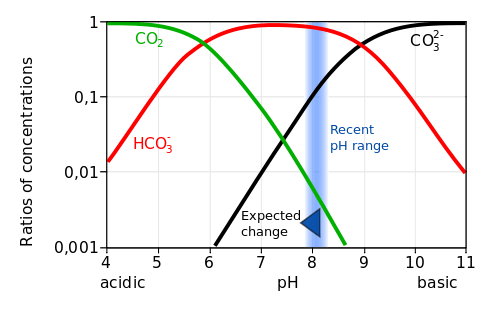 Moreover, Pierrehumbert in his Section 8.4 explains a set of complicated interrelationships which I don’t completely understand, where carbonate ions in solution impede carbon dioxide uptake and, so, apparently, at some point, oceans refuse to accept more carbon dioxide. I can’t answer your question, but wish I knew more about these issues, so thanks for the references. My own interest comes in part from trying to understand the CO2-temperature feedback loop that seems to be important for understanding the Earth’s glacial cycle. It’s obvious how higher atmospheric CO2 concentrations increase temperature: the greenhouse effect. But it seems that perhaps higher temperatures also increase atmospheric CO2, creating a feedback loop that amplifies the rather small Milankovitch cycles. And according to Didier Paillard this is not fully understood. The obvious mechanism—warmer liquids can hold less dissolved gas—seems to be insufficient. Or so he said. • Ocean acidification: details, Azimuth Library. The first reaction is the formation of carbonic acid H2CO3 from water and carbon dioxide. The next reaction is the splitting of carbonic acid into a hydrogen ion and a negatively charged bicarbonate ion, HCO3–. In the third reaction, the bicarbonate ion further ionizes into an H+ and a doubly negative carbonate ion CO32-. • Stephen E. Bialkowski, Carbon dioxide and carbonic acid.